Respondent Parents’ Counsel (RPC) in dependency and neglect cases (also known as “child welfare” or “child protection” cases) play a critical role in protecting the constitutional and other legal rights of parents, preserving family relationships, and providing complete, accurate, and balanced information to courts. In recognition of this critical role, the Colorado Children’s Code affords parents who are respondents in a dependency and neglect case the right to counsel. § 19-3-202(1), C.R.S. 2014. The Children’s Code also affords indigent respondent parents appointment of counsel at state expense. § 19-3-202(1). Respondent Parents Counsel formerly operated under Chief Justice Directive 04-05. Efforts were made over the past decade to support and enhance the quality of parent representation in dependency and neglect cases. Former Chief Justice Mary Mullarkey convened an RPC Task Force in 2005 to assess training, compensation, practice standards, and models of representation for RPC and make recommendations to the Colorado Supreme Court and members of the General Assembly. In 2005, the Colorado Supreme Court through the Colorado Court Improvement Program created the Respondent Parents’ Counsel Task Force, a group of child welfare professionals, to review the issues facing respondent parents’ counsel and to make recommendations to the Supreme Court and the Colorado Legislature. This RPC Task Force commissioned the National Center for State Courts, the National Association of Counsel for Children, and the National Council for Juvenile and Family Court Judges to perform a needs assessment of respondent parent representation in Colorado. To assist in identifying needs of attorneys, areas in need of improvement and baseline data for potential reform efforts, the Task Force commissioned a needs assessment. This assessment, performed by the National Center for State Courts, National Council of Juvenile and Family Court Judges and the National Association of Counsel for Children, provides both a statewide overview of factors impacting Respondent Parents’ Counsel performance as well as an in-depth analysis of four counties: Denver County, El Paso County, Teller County and Weld County. Final Reports of this Needs Assessment and RPC Task Force were published in 2007. Although some of the recommendations were implemented, many challenges faced by RPC, along with barriers to effective representation identified in these reports, remained. In 2012-2013, Judges David Furman and Daniel M. Taubman had extensive meetings with employees of the State Court Administrator’s Office and court personnel to address RPCs’ continuing challenges and to offer suggestions for improving the quality of RPC appellate advocacy. These meetings led to a request for the General Assembly to fund a Respondent Parents’ Counsel Coordinator position in the State Court Administrator’s Office. The General Assembly did so, and in 2013, this position was fully funded and a coordinator hired. These meetings also led to two state-wide training conferences for respondent parent appellate attorneys. During these meetings, a suggestion circulated that a Work Group be established to further analyze RPC representation in Colorado. He also charged the Work Group with evaluating the appellate process and making recommendations for improving the quality of appellate advocacy. Finally, he instructed the Work Group to analyze potential centralization of RPC administration. While the Work Group developed its recommendations, the General Assembly took a significant step toward enhancing RPC representation through new legislation, which created the Office of the Respondent Parents’ Counsel (ORPC). This legislation gave the Work Group the responsibility of recommending an operational structure for the ORPC by September 30, 2014. See § 13-92-101(3), C.R.S. 2014. In response to this legislation, the Work Group shifted its primary focus from analysis of the current RPC practice to analyzing various agency operational structures in this state together with parent representation models across the country. The intent of this shift was to make recommendations for an operational structure best suited to resolve the ongoing concerns and challenges regarding respondent parent representation in Colorado. On May 29, 2014, Governor Hickenlooper signed SB-14-203 which established the Office of the Respondent Parents’ Counsel effective January 1, 2016. The legislation defers to the RPC Work Group’s final recommendation regarding the operational structure of the Office of the Respondent Parents’ Counsel. The Work Group then shifted its focus to analyzing the various oversight options in order to recommend an operational structure to oversee the RPC program. A public meeting was held on August 14, 2014. The preliminary recommendations of the Work Group were discussed. These recommendations and the results of the statewide surveys were discussed during the meeting. The final report containing the Work Group’s recommendations was submitted to the State Court Administrator on September 30, 2014. 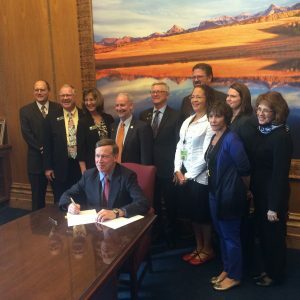 On April 24, 2015, Governor Hickenlooper signed HB 15-1149, concerning the respondent parents’ counsel and in connection making and reducing appropriation. This bill established Respondent Parents’ Counsel Governing Commission by July 1, 2015 and transferred state paid respondent parent counsel appointments to ORPC beginning July 1, 2016. The bill expressed the Director’s position and qualifications. The bill moved court appropriation for court-appointed counsel and staff from the State Court Administrator’s Office to the Office of Respondent Parents’ Counsel. The Office of Respondent Parents’ Counsel drafted Chief Justice Directive 16-02 to guide the appointment, payment, and training of respondent parents counsel, effective July 1, 2016. The ORPC’s mission is to protect the fundamental right to parent by providing effective legal advocates for indigent parents in child welfare proceedings. This right is better protected when a parent has a dedicated advocate, knowledgeable about child welfare laws and willing to hold the state to their burden. Our duties are to provide training and resources, develop practice standards, and advocate for systemic and legislative changes in Colorado. The Office of Respondent Parents’ Counsel (ORPC) provides legal representation for indigent parents in child welfare cases. Respondent Parents’ Counsel play a critical role in achieving positive outcomes for children in child welfare cases; protecting the legal and due process rights of parents; presenting balanced information to courts and promotion the preservation of family relationships.